Everybody loves Windows Aero. But it eats-up your computer's battery usage. Turn it off, while on mobile and surfing the net. It can give you a minimal boost in performance and a good Battery Usage. WinBubble can turn it off in three ways. Speed up your search through the different search options. Disabling the search in the File index can have a large difference. Stopping the search in Communication files such as Windows Live Mails removes annoyances. 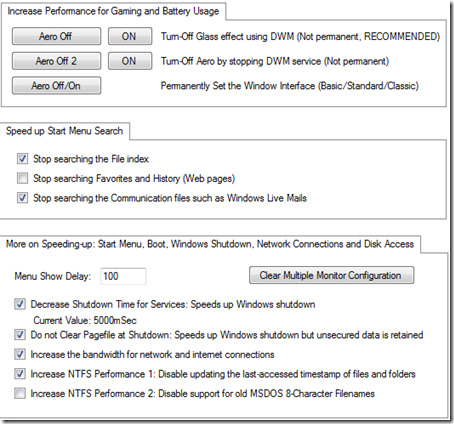 Speeds up Windows Shutdown by decreasing the Shutdown time for Services. Choose between Security or Performance: Clearing the Pagefile at Shutdown can decrease your shutdown time but it will increase your security. 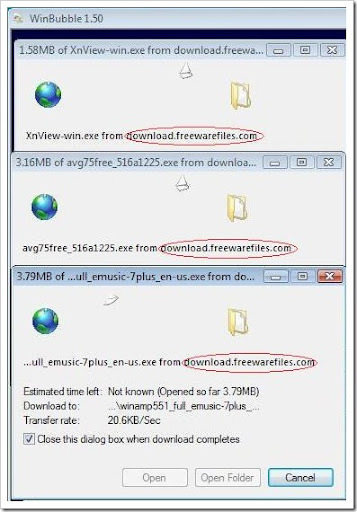 Download more than two files on the same server by increasing the number of Internet connections. Increase your disk performance by disabling the constant updates of last-accessed dates/timestamp in files and folders. Also, Disable the support for old MSDOS 8-character filenames to increased your disk performance. Make sure that you are not using any old programs.